Everyone is welcome to visit the TU/e Library and consult our collection, whether or not you are a student or staff member at TU/e. In the TU/e Library you will find an extensive and up-to-date collection of scientific information. Via the Internet, the Library provides access to a wealth of digital information. At the central library a collection of printed information resources (mainly books and journals) is at your disposal. The Library acquires literature on almost all branches of science and technology. The main subjects are technical sciences, physics, chemistry, mathematics, computer science, architectural sciences, industrial and management sciences, social sciences, biomedical engineering, and industrial design. The Library website www.tue.nl/library is the gateway to an extensive digital library. As a TU/e student or staff member you may access the digital library from wherever you are, whether on the campus, at home, in an Internet café or at the firm of your final traineeship. Our digital library is open 24 hours a day, 7 days a week. quick reference (e-books): dictionaries, encyclopedias etc. Beside the digital library, the TU/e Library offers an extensive and up-to-date scientific collection of printed information resources, such as books, journals, scientific reports, dissertations, etc. Starting September the fully redeveloped and centralized TU/e Library will be located in MetaForum, the building in the centre of the campus. It provides the TU/e community with an inspiring and information-oriented environment for individual and collective study and work. 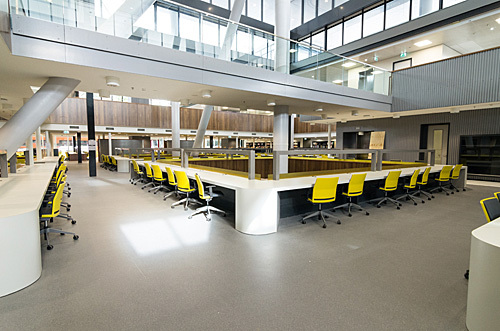 There are over 950 study seats divided into quiet areas near the book collection and workspaces where groups of students can discuss their assignments. Each seat is equipped with wireless Internet access. Students may borrow publications from the Library free of charge using a fully automated loan system.